James Spann has the Alabama forecast for Thursday and beyond from Alabama NewsCenter on Vimeo. 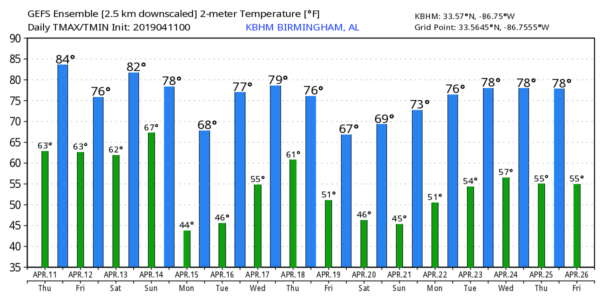 SUMMER PREVIEW CONTINUES: The high in Birmingham yesterday was 85 degrees — 12 degrees above the average high of 73, and 3 degrees shy of the record high for April 10 of 88, set in 1995. Look for similar warmth today; we reach the mid 80s this afternoon with a partly sunny sky. A strong south wind will develop during the day, averaging 15-25 mph with higher gusts; a wind advisory is in effect for about the northern third of the state. Clouds will increase tonight, and a band of showers and storms will enter northwest Alabama after midnight ahead of a cold front. The front will drift into central Alabama on Friday and become stationary; the day will be mostly cloudy with a few passing showers, and possibly a thunderstorm in spots. It won’t rain all day, rain amounts should be light and the high will be in the mid 70s. FRIDAY NIGHT/SATURDAY: The stalled front will lift northward as a warm front Friday night, and rain is a good possibility for about the northern third of the state. On Saturday, the most widespread rain should be north of here, up in Tennessee, as the warm front continues to move northward. In Alabama Saturday will be warm and mostly dry, although a few widely scattered showers are possible. With a mix of sun and clouds, temperatures will rise into the 80- to 83-degree range by afternoon. SEVERE WEATHER POTENTIAL SUNDAY: A vigorous weather system will bring the chance of severe thunderstorms to Alabama Sunday. The Storm Prediction Center has most of the state in a severe weather risk. Model output is showing a slower solution, and we now believe the main 12-hour window for severe thunderstorms will come from 3 a.m. until 3 p.m. Sunday. Initially over west Alabama, the threat will shift slowly eastward during the day. All modes of severe weather will be possible, including large hail, damaging winds and tornadoes. It is important that you place yourself in a position to hear severe weather warnings Sunday, and take some time to review your family action plan. Know where you are going, and have helmets, portable air horns and hard-sole shoes for everyone in that safe place. If you live in a manufactured home, identify a shelter or other site-built home or business nearby that is available on weekends and during pre-dawn hours. And every church must have a way of hearing warnings (NOAA Weather Radio is the best bet), and have a plan to get people into a safe place in the event a tornado warning is issued and the church is in in the polygon. FOOTBALL WEATHER: Both Auburn and Alabama have their spring football games Saturday; Alabama’s scrimmage begins at 1, Auburn’s at 3. For both sites, the weather looks pretty good — mixed sun and clouds with temperatures in the low 80s. We can’t rule out a brief shower in Tuscaloosa; Auburn should be totally dry. NEXT WEEK: Monday and Tuesday will be dry with cool mornings and mild afternoons — lows in the 40s and highs in the 70s. Another robust weather system will bring a chance of strong to severe thunderstorms Thursday. ON THIS DATE IN 1965: Severe thunderstorms in the Upper Midwest spawned 51 tornadoes killing more than 250 people and causing more than $200 million damage. Indiana, Ohio and Michigan were hardest hit in the “Palm Sunday Tornado Outbreak.” Although no F5s were officially reported, at least 22 were rated as F3 or F4. This is the third-deadliest day for tornadoes on record, behind the Super Outbreak of April 3, 1974, and the outbreak that included the Tri-State Tornado of March 18, 1925. Dr. Ted Fujita discovered suction vortices during the Palm Sunday tornado outbreak. It had been believed the reason why tornadoes could hit one house and leave another across the street completely unscathed was because the whole tornado would “jump” from one house to another. However, the actual reason is because most of the destruction is caused by suction vortices: small, intense mini-tornadoes within the main tornado.